The normal Council Planning Approval process involves the building being assessed according to strict guidelines laid out in the 2008 Development regulations. When a Heritage building is involved in a Development application a Heritage specialist is engaged by council to determine if the application has merit or should be vetoed. This involves not only additional costs but an additional month can usually be added to the time it takes to assess the proposal. I worked for one of Adelaide's most prominent Heritage Architects (Ron Danvers Architects) almost 20 years ago and have some knowledge on the subject as well as a love of old buildings and their Gardens. As part of my work there I prepared measured drawings and a building fabric assessment report for St Johns Church in Halifax street. Heritage Architecture is a specialist field and as it also involves a degree of subjective assessment I employ a Heritage consultant to assess any designs before they are submitted to Council to avoid costly delays and abortive work. This streamlines the process and guarantees the best possible outcome while still reaping the benefits of my very reasonable hourly rate. In Adelaide we have a Heritage suburb. Colonel Light Gardens was designed as a reaction to increasing world-wide Industrialisation and was a Utopian Dream for the working class man. 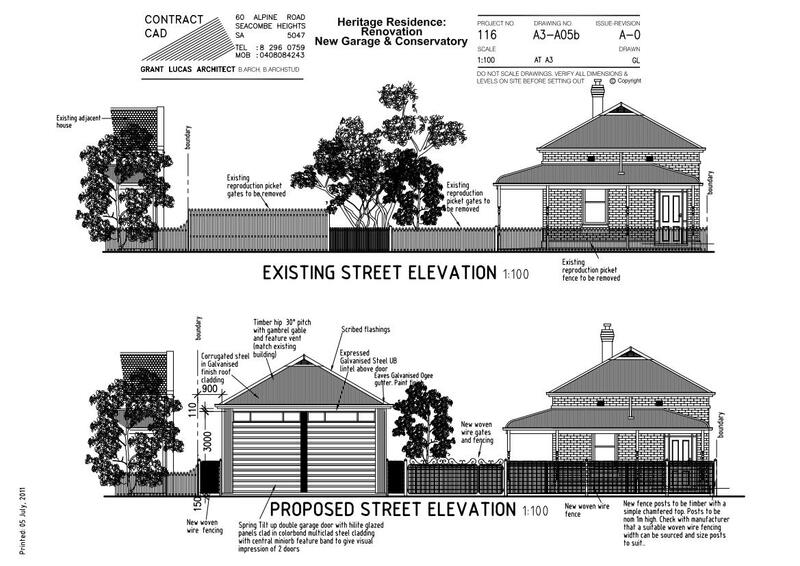 Due to the unique status of this suburb any work on one of the existing bungalows involves getting Heritage approval before development approval can be granted. This following documentation set was a budget Kitchen extension designed to meet the needs of a growing family. The documentation took a week to produce and although there were no amendments required it was still about 7 months before building could start due to the protracted administration processes Council employs in any Heritage matter. 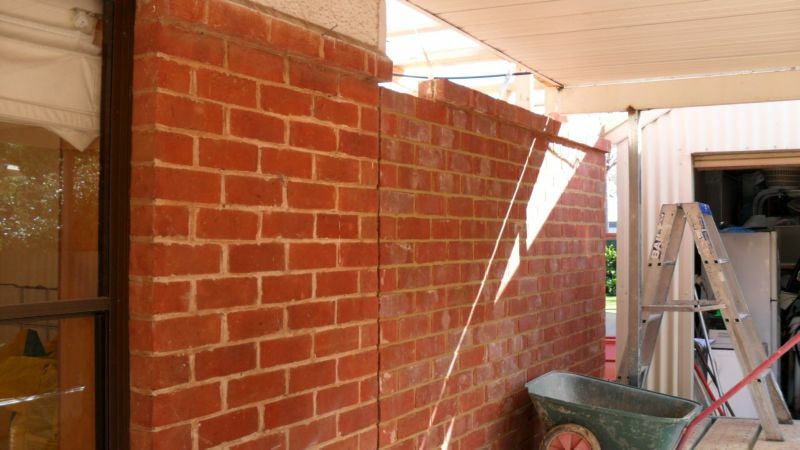 Recycled bricks and the the use of stuck joints and Brighton lite cement helped achieve a high level of finish that complimented the existing building fabric. Even before this wall is cleaned it looks good. Modern red bricks are larger than those used 80 years ago. The use of recycled bricks and struck rather than ironed joints ensure a good result. When the wall is finished the mortar color will lighten. It is important to get tradesmen who know how to lay older style bricks. Too crisp and clean a result can look as bad as too messy. This builder used a father son team who specialise in small fussy jobs like this one. Brighton light white cement is added to the mortar mix to lighten it to approximate the colour of an old fashioned lime mortar. It is important that the proportions are carefully gauged to ensure the proper colour match.